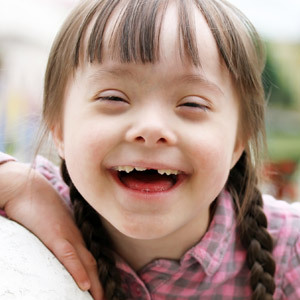 Dental disease doesn’t discriminate by age. Although certain types of disease are more common in adults, children are just as susceptible, particularly to tooth decay. Unfortunately, the early signs of disease in a child’s teeth can be quite subtle—that’s why you as a parent should keep alert for any signs of a problem. Here are 3 things you might notice that definitely need your dentist’s attention. Cavities. Tooth decay occurs when mouth acid erodes tooth enamel and forms holes or cavities. The infection can continue to grow and affect deeper parts of the tooth like the pulp and root canals, eventually endangering the tooth’s survival. If you notice tiny brown spots on their teeth, this may indicate the presence of cavities—you should see your dentist as soon as possible. To account for what you don’t see, have your child visit your dentist at least twice a year for cleanings and checkups. Toothache. Tooth pain can range from a sensitive twinge of pain when eating or drinking hot or cold foods to a throbbing sharp pain. Whatever its form, a child’s toothache might indicate advancing decay in which the infection has entered the tooth pulp and is attacking the nerves. 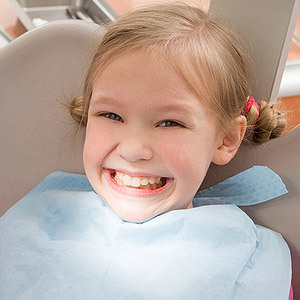 If your child experiences any form of toothache, see your dentist the next day if possible. Even if the pain goes away, don’t cancel the appointment—it’s probable the infection is still there and growing. Bleeding gums. Gums don’t normally bleed during teeth brushing—the gums are much more resilient unless they’ve been weakened by periodontal (gum) disease (although over-aggressive brushing could also be a cause). 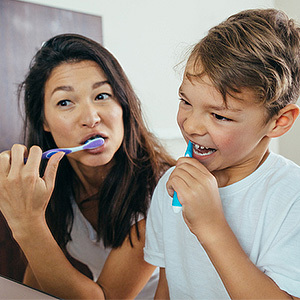 If you notice your child’s gums bleeding after brushing, see your dentist as soon as possible—the sooner they receive treatment for any gum problems the less damage they’ll experience, and the better chance of preserving any affected teeth. If you would like more information on dental care for your child, please contact us or schedule an appointment for a consultation. Tooth decay is an ever present danger for your baby’s developing teeth. It begins with disease-causing bacteria feasting on leftover sugar, producing high levels of oral acid that slowly dissolves the teeth’s protective enamel. The softened enamel then becomes an open door for decay to infect the tooth. Meanwhile, those bacteria continue to eat and produce acid…. So how can you stop this devastating cycle? Besides daily oral hygiene and regular dental visits, the most important thing you can do is deprive bacteria in your baby’s mouth of sugar through limiting their consumption of it. This means you’ll first need to identify the different sources of sugar available to your baby—and some of them might surprise you. Here, then, are 3 not-so-obvious sugar sources your baby might be consuming. During feeding. If you’re breast-feeding, you may not think this is causing a sugar problem for your baby. True, breast milk by itself doesn’t promote decay: it’s the combination of it with other sugar-rich foods and liquids the baby might be consuming as they get older. Together this could significantly increase their risk of pediatric tooth decay (also known as early childhood caries or ECC). So, be careful to limit sugar in other things they’re eating or drinking in addition to nursing. 24/7 Baby bottles and pacifiers. To calm infants at nap or sleep time, parents or caregivers often use bottles filled with sweet liquids or pacifiers dipped in jam, syrup or sugar. This practice increases decay risk from both the added sugar and its constant availability to bacteria in the mouth around the clock. Instead, avoid this practice and limit any sugary foods or liquids to mealtimes. Medications. Some medications an infant may be taking for a chronic illness may contain small amounts of sugar. Additionally, medications like antihistamines can reduce the production of saliva that’s needed to neutralize acid after meals. If your child is on medication, ask your healthcare provider about its dental effects and if there are any sugar-free alternatives. Be sure to keep up daily brushing and flossing and regular dental visits too. Limiting your baby’s sugar intake is critical in preventing tooth decay. It’s one of the most important things you can do to protect their dental health.